A couple of weeks ago I wrote about the Penguins needed a new cult hero. A cult hero in hockey is a non-superstar that a fanbase has a ravenous affinity for and Pascal Dupuis certainly fits this description. This became readily apparent to me when he returned to the ice the very next game following being taken off of the ice on a stretcher during the game against the Dallas Stars on October 16. That tweet from PensInitiative.com's own @MadChad412 sums up the sentiment of a lot of Penguins fans about Pascal Dupuis. He really is Super Duper. Instead of being the throw-in on the Marian Hossa trade in 2008, it now appears that Marian Hossa was the throw-in in the Pascal Dupuis trade. Hyperbole aside, since arriving in Pittsburgh, Dupuis has amassed 105 goals and 222 points in 426 games including last night's 1G (PP) and 1A effort against the New Jersey Devils. 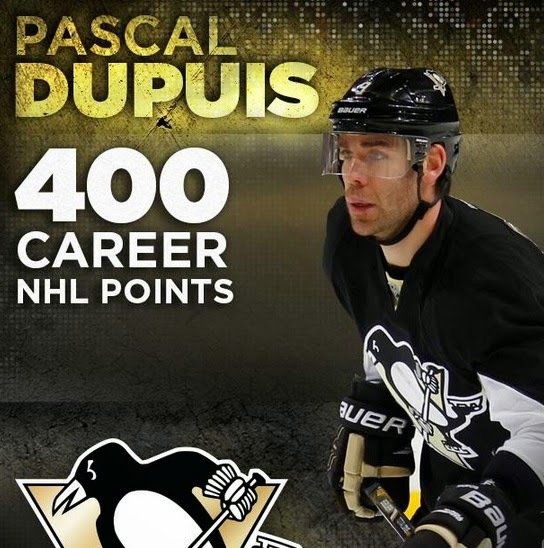 During the October 25th game in a 3-0 win against the Nahsville Predators, Dupuis notched his 400th career NHL point. The numbers he's put up are hardly "superstar" caliber, but they are more than respectable. This is especially the case given that Dupuis was originally a mere afterthought that only the most die-hard of hockey fans had heard of when that trade was made. Beyond the career numbers, however, are the intangibles that has made Pittsburgh fans fall in love with Dupuis. "Thanks Dan" is something that Penguins' fans get geared up for whenever Dan Potash is set to interview Dupuis. Hockey players are known for their toughness, and Duper certainly fits that bill. Not only did he return in time for the first game of this season after suffering a season ending knee injury in December of 2013, prior to that, he pulled two of his own teeth during a game. Not to mention, Dupuis just looks like he knows how to have a good time off the ice as well. He appears to be someone that you would like to share an ice cold adult beverage with. Penguins hockey has become fun to watch again with the early returns on the up-tempo score as much as possible puck possession Mike Johnston system. Don't tell that to Pascal Dupuis, though. It looks like he has been having fun for years and that he is the cult hero that Pittsburgh has been looking for.